Equinox Pine Street has been my gym of choice since I moved to San Francisco from New York City in 2011. It has everything I look for in a gym – an excellent (saline) pool, proximity to my office, Kiehl’s (a guilty pleasure, admittedly) flowing from the walls, and a wide variety of electro-pop to choose from in spin class. Just last week, I received an email from a personal trainer who invited me to participate in a complimentary fitness assessment, and I jumped at the opportunity for a benchmark. Well, that’s the thing. There was the arthroscopic repair of my right labrum and rotator cuff (and the subsequent open repair of the first surgery). I’ve broken both of my hands, my nose veers to the right and my posterial tibial tendon is a distant memory. Glory days – crossing the finish line at IM Lake Stevens 70.3 2013. Eight marathons, two ultras, and four long course triathlons later, I’m extremely grateful for my body’s recovery capabilities. In an effort to keep that in tact, stay strong and go long, I recently started a triathlon specific lifting program. I was enjoying a routine set of back lunges, and then it happened: pop, pop, pop, pop! It was my quad. One long step back triggered what felt like me in a room of bubble wrap: a series of pops, and an unequivocal notion that something had to give. 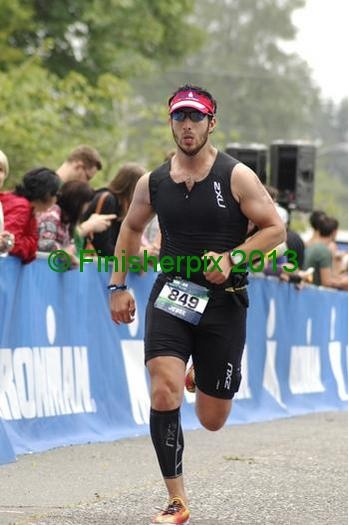 Four weeks after a PR marathon at San Francisco 26.2, I went for a PR Half Ironman in Lake Stevens, WA. Two weeks later, I toed the line for a PR 10K at the Giant Race in San Francisco. I could count the number of foam rolling sessions on one hand. Stretching consisted of me reaching for the sour candy I hid from Taylor on the top shelf. I didn’t get a proper massage after any of the races; did I push it too far this time? It’s too early to tell, but fortunately, I’m not in pain, and my range of motion doesn’t seem to be compromised; I even managed to push off my wounded quad to grab the treats off the top shelf. If nothing else, today served as a wakeup call: the next time the check engine light comes on, I’m not going to wait to hear a pop before I take my car in for maintenance.